Born 21st Sept 1952, Rockhampton. 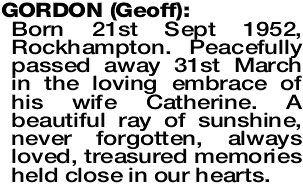 Peacefully passed away 31st March in the loving embrace of his wife Catherine. A beautiful ray of sunshine, never forgotten, always loved, treasured memories held close in our hearts. 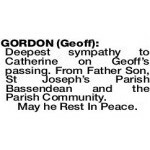 A Funeral Mass for the late Mr Geoffrey Gordon will be held at St Joseph's Catholic Church, 19 Hamilton St, Bassendean, TUESDAY (9.4.2019) at 10.00am. 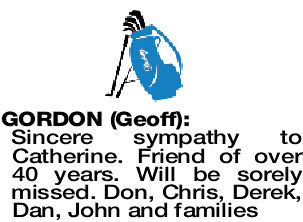 At the conclusion of the Mass the cortege will proceed to PINNAROO Cemetery East Chapel for a Committal Service. Rosary will be recited prior the Mass commencing at 9.30am at the church. 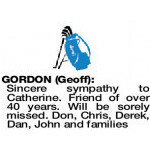 GORDON GEOFF Deepest sympathy to Catherine on Geoff's passing. From Father Son, St Joseph's Parish Bassendean and the Parish Community. 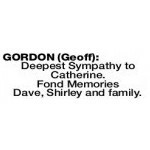 GORDON GEOFF Deepest Sympathy to Catherine.